"Don’t be one of the 32% of customers who order a TV Mount to only find it doesn’t fit and are forced to pay $25.29 on average for return shipping costs! “ Get the AVX Fit Guarantee. At AV Express we are dedicated to insuring a trustworthy shopping experience and complete 100% customer satisfaction. So we developed our Industry leading Fit Guarantee program. Quite simply use our TV Mount finder and fill in all the fields with 100% accurate information and we will provide you with a list of TV Mounts which will fit your TV. Should the TV mount that we shipped you not fit and you used our TV Mount Finder or does it fit button, we will refund you 100% of your order total. You will not incur restocking fees, conditional fees, not even return shipping fees. Just a 100% full refund. In addition one of our technicians will contact you to resolve the problem and get a new mount out to you ASAP. Complete customer satisfaction at all costs, that is our goal! 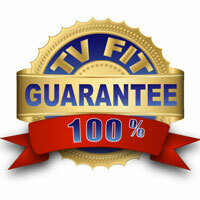 To qualify for our TV Fit Guarantee, you must use our TV Mount fit finder and then order one of the suggested TV Mounts. Or you can check at the item level to see if that Mount will fit your TV. Simply click does it fit area. All detailed information on the form must be 100% accurate. Should you put in the wrong TV model number, weight, manufacturer, and VESA size you will not qualify for our TV fit Guarantee. All returns must be in the original box with all original packing material and parts. Slight wear marks are acceptable but customer damaged items are not returnable under the fit Guarantee Program. You have up to 30 days from purchase to make a Fit Guarantee Claim. For additional information feel free to call us: (877)302-8397 or email us at: sales@av-express.com. "Your TV Fits Guaranteed or We Pay All Fees"